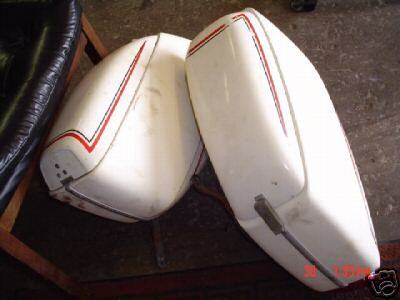 Wixom saddlebags (and trunks) were made by the Wixom brothers of Long Beach, California. 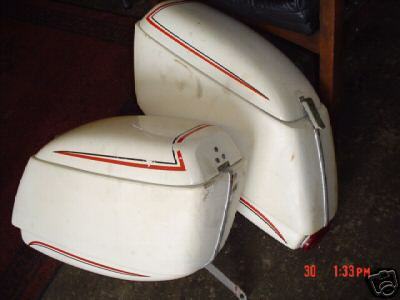 Their design was not unique to Moto Guzzi, as they also sold mounts for other motorcycle brands (notably BMW). 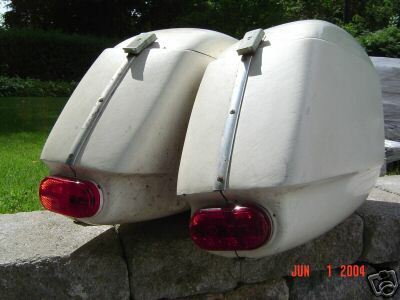 But, the shape of the fiberglass saddlebags have proved especially attractive as they complement the lines of the Moto Guzzi V700, Ambassador, and Eldorado. At some point in the 1970's(? ), Arthur Fulmer bought out Wixom and continued to manufacturer these bags for a couple years. Photo courtesy of eBay auction. I extracted this information from John Mee and Charlie Mullendore of Antietam Classic Cycle off of the Yahoo! Loopframe_Guzzi news group. 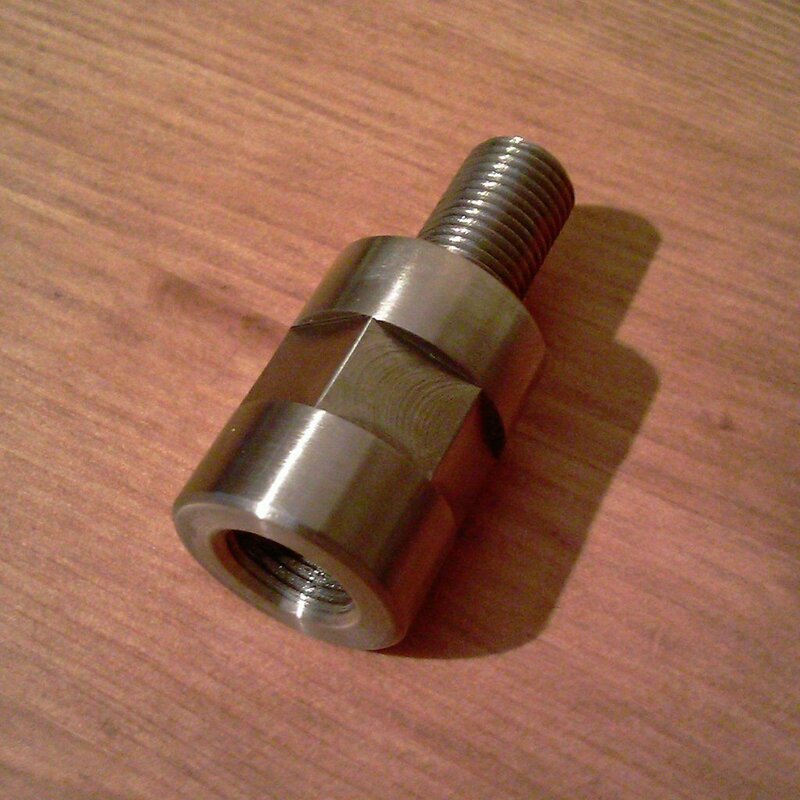 M10 coupling nuts: McMaster-Carr part number 93020a782. 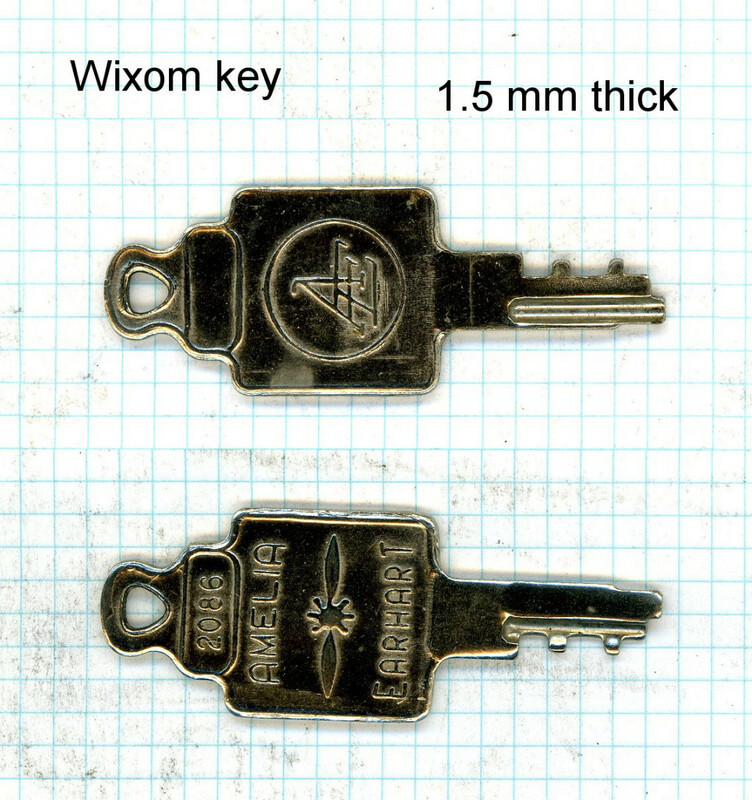 The originals supplied by Wixom were 3⁄4 inch hex and 1 inch long, those are 16 mm hex and 24 mm long. There are other lengths and stainless ones as well on McMaster's website. I have the same problem and have bought some of these (Metric Stainless Stand off Bolt Extender Extension Male to Female). They are quite classy and stainless. 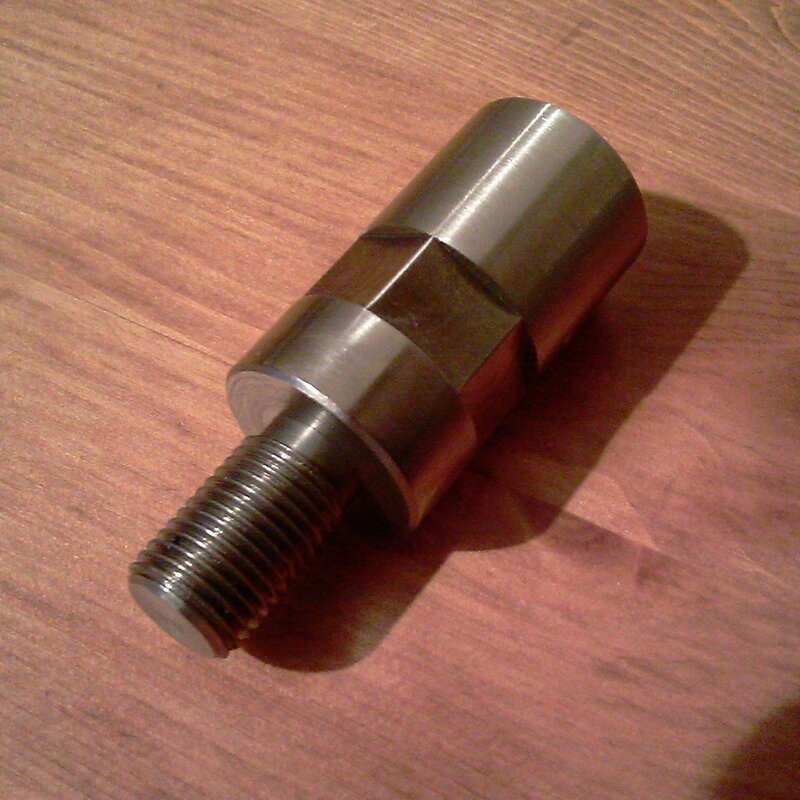 Rear shock spacer for mounting Wixom saddlebag brackets. My Wixom (actually Arthur Fulmer) bags came with mounts labeled for a Suzuki 750 that look very different than the curved mounts we're used to seeing for the Loops. I had modified the pieces to work on my Eldorado. The two pieces I actually ended up using are shown in these two photos. The photos show what I have after I further modified everything to work with the rear rack. It was at this time that I realized this could point the way for a relatively easy do-it-yourself mount. The two pieces form a T held together with a carriage bolt. It could all be made from hardware store steel. Bend it in a vise with a hammer and drill some holes. Carriage bolt holes need to be square, which can be finished with a small triangular file. 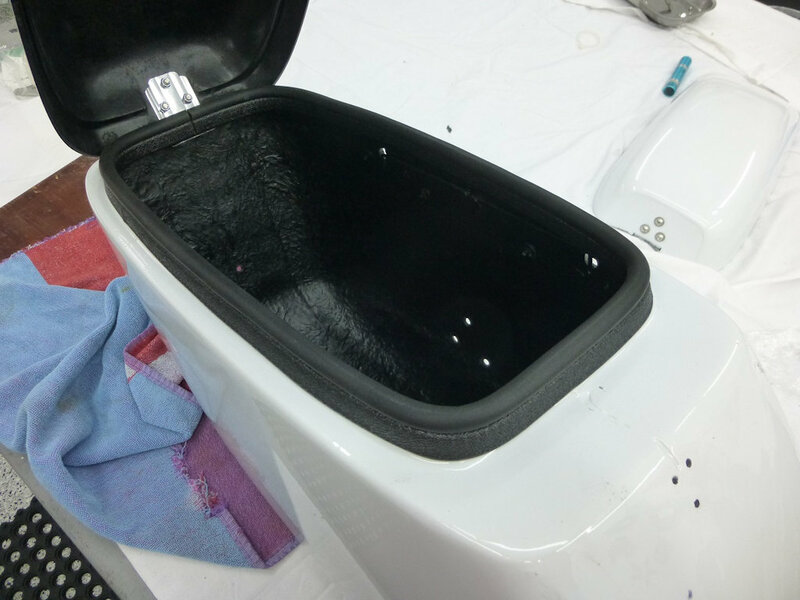 Obviously there's nothing keeping the rack from swinging laterally, so I added the piece connecting the bottom of the T to the rear seat mount. Four bends and two holes give the whole thing a lot of rigidity while keeping the look clean. I didn't have to worry about the actual mounting pieces that hold the bags, but you will if you build from scratch. The top two holders appear to be clevis pins set in holes and welded. Could epoxy work here? I haven't figured out the bottom mounting piece yet, but it's also set in a hole and welded. Someone else must know what that piece is. Bolting the frame together rather than welding it works fine and gives it flexibility in case your measuring isn't perfect. I don't know if it's as rigid as the familiar curved rack. But, this seems to work pretty well. 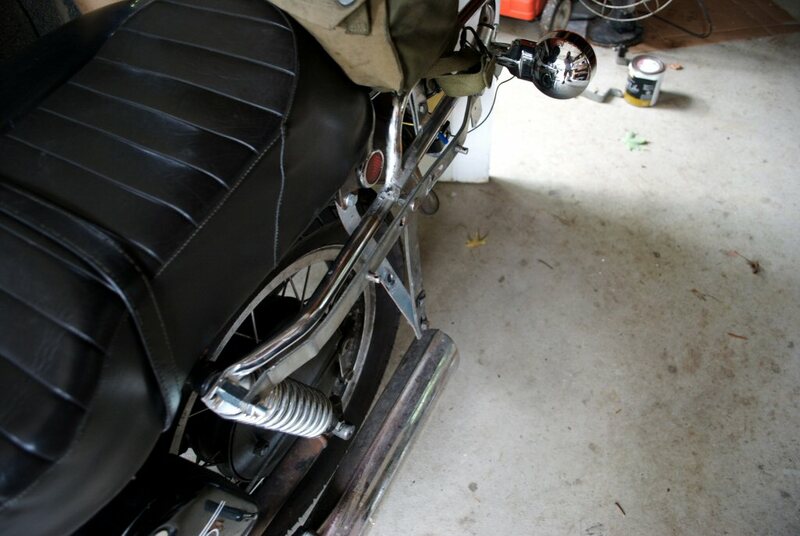 Wixom saddlebag brackets from a Suzuki adapted to a Moto Guzzi Eldorado. Photo courtesy of David Bodner. 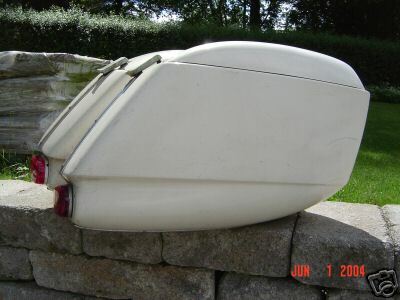 I have found that McMaster-Carr part number 1120A312 Water- and weather-resistant hollow foam rubber push-on seals with bulb on top is a very good fit for Wixom saddlebag lids. 10 feet is enough to do 2 bags. No need for glue, just push on. I extracted this information from John Prusnek off of the Yahoo! Loopframe_Guzzi news group. 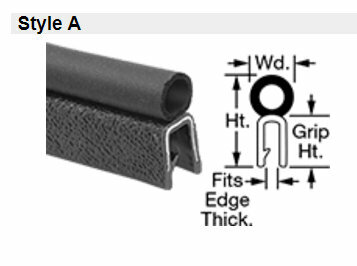 To seal saddlebags I've used the closed cell foam strips they sell at hardware stores for insulating around doors and windows. It's nice and cushy so they seal tight and don't rattle, and is self adhesive on one side for easy installation. The light is really no biggie unless you're a stickler for originality. Peterson Manufacturing Company has a near perfect replacement for the original: Part number 135. The lens will even fit the original base but doesn't snap on very securely. I've seen the complete light at the local NAPA and Lowe's for around USD $3.00. Photo courtesy of Peterson Manufacturing Company. Thanks to Jim Pisot for sending me the following information in an e-mail. 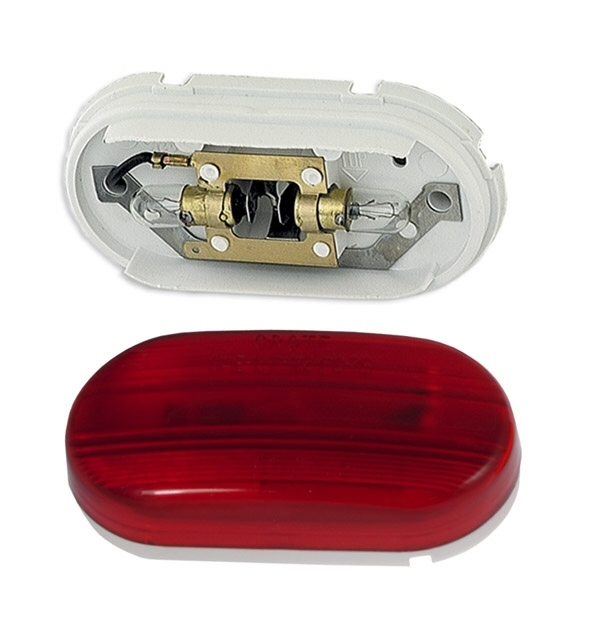 Grote Industries part number 91572 or 90202 lenses also work on the original fixtures. Likely easy to find at NAPA, other auto parts, trailer/RV stores. 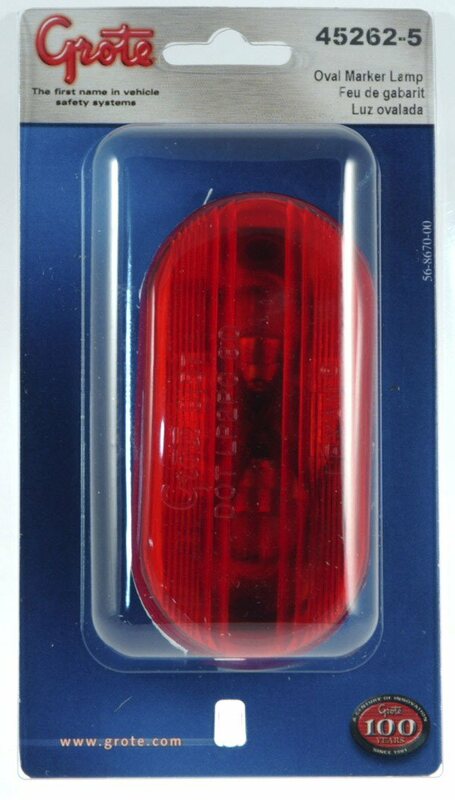 Likely the Lamp Grote Industries part number 45262 Red would suit as a complete replacement lamp. Photo courtesy of Grote Industries. Thanks to Jack Huisinga for sending me this information. In case you ever need to fabricate one. Grid is 0.1 inch. Guess I should have put that on the image too. 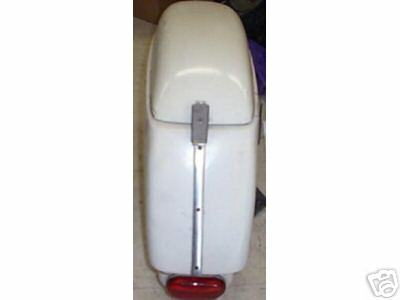 I bought an old Wixom top box for around town use. Detail of an Amelia Earheart key on grid paper. Amelia Earheart was a manufacturer of luggage and the keys they used just happen to work in the latches used on the Wixom saddlebags. Photo courtesy of Jack Huisinga. Amelia Earheart key in an original Wixom saddlebag latch. I extracted this information from Charlie Mullendore of Antietam Classic Cycle off of the old Topica Loopframe_Guzzi news group (which has now moved to Yahoo!). I've been looking at these latches as replacements on my Wixom bags McMaster-Carr part number 1863A23. They're 2 1⁄2 inch long, 1 1⁄4 inch wide, protrude 13⁄32 inch, nickel-plated, and key locking. I was perusing your info on the Wixom bags. 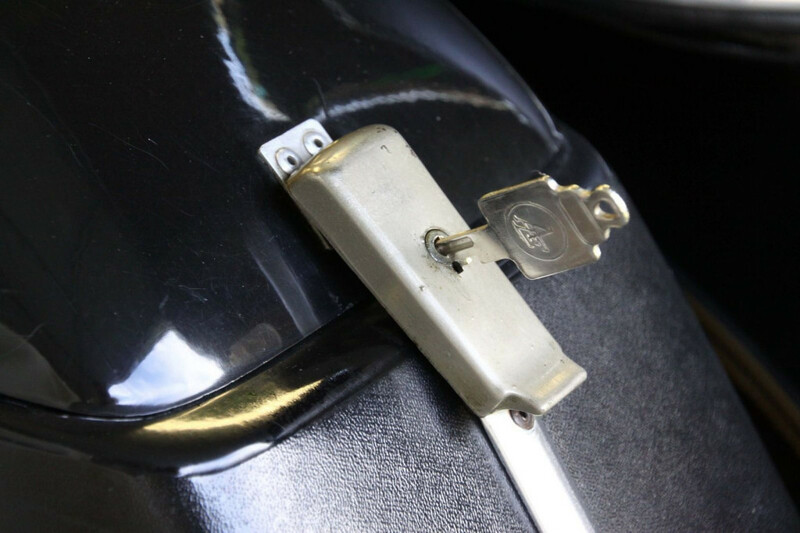 Here's a tidbit of info for you on the latches from a BMW site: Wixom latch sets, new w/keys, USD $12.00/pr, free shipping in USA. 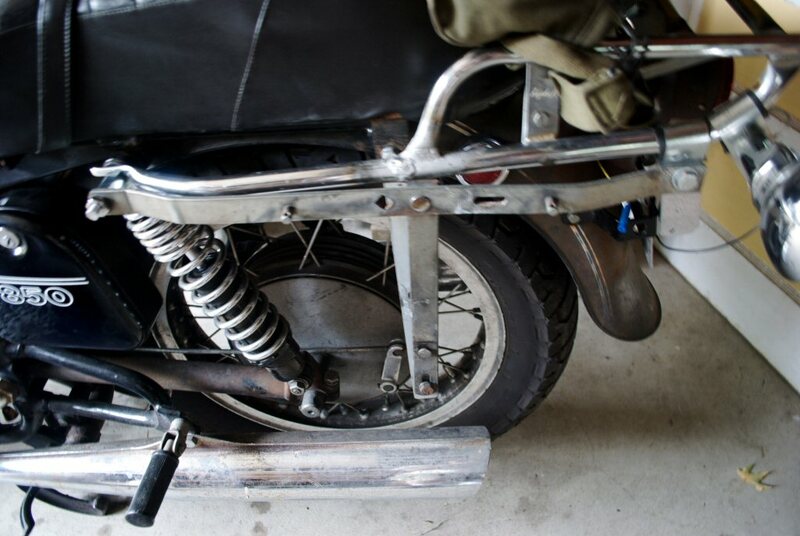 It is a Jap bike wrecker but ya gets the goodies where ya can :) Thanks to Brent C. Schapansky. You can get stock lengths of this aluminum trim from Restoration Supply Company Inc.. 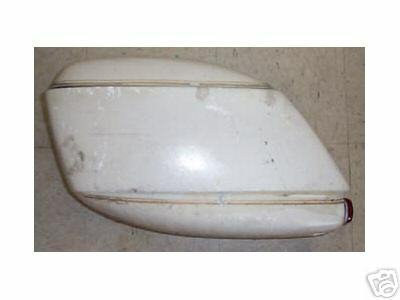 The shape and size you are looking for is called half oval 3⁄16 inch × 5⁄8 inch . You will need approximately 39 inch for each bag. In aluminum it only comes in an 8 ft stick and is USD $36.95 plus shipping. The part number is MOU029. You will have to bend it and countersink drill it so the rivets or screws are flush with the trim. I hope this helps you out. Thanks to Charlie Mullendore of Antietam Classic Cycle for sending me these instructions.